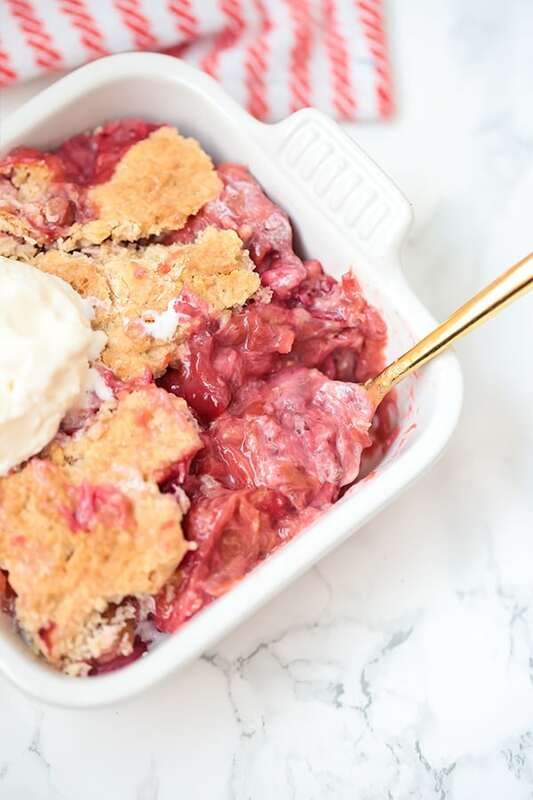 This strawberry rhubarb crisp screams summertime! It’s packed with flavor and is a healthier paleo version a classic. After I made my paleo apple crisp at Thanksgiving, I was already planning for this recipe in the summer. Strawberry rhubarb has always been a classic combination that’s intrigued me, but for some reason, I never tried it until this spring. And boy, was I missing out! The flavor is spot on for summer and sweetened by nature. 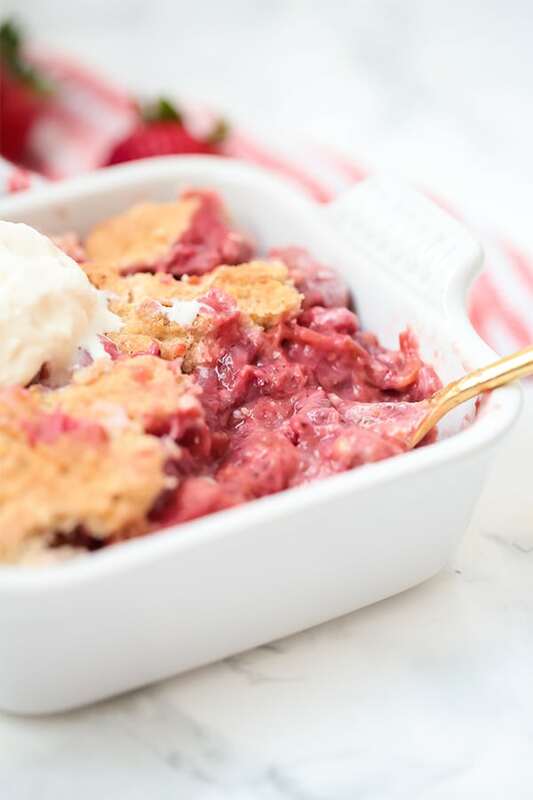 Adding a crisp topping to the amazing flavor combination only makes it even more delicious in this Strawberry Rhubarb Crisp. 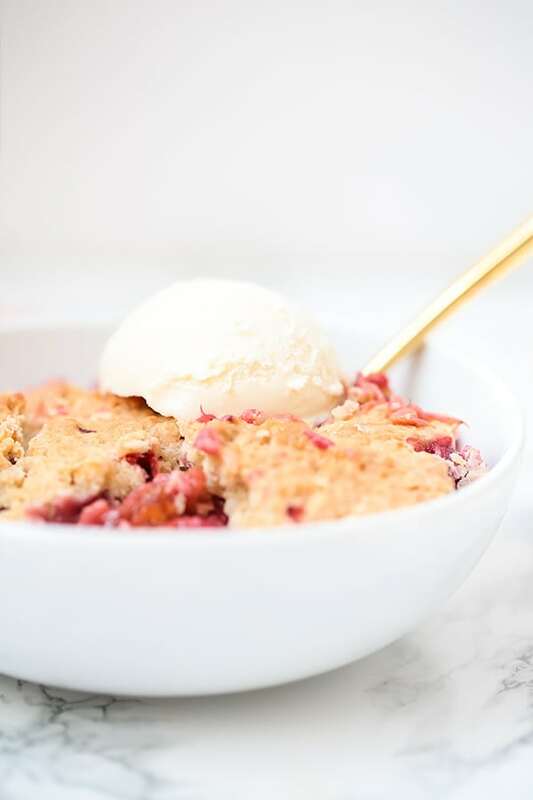 Not only is the strawberry rhubarb to die for, but the crisp topping is on point. It’s basically just one big crispy cookie topping. Pinch me. I could eat this all day long, but realistically, this is perfect for bringing to a summer gathering or serving at your own backyard BBQ. It’s paleo, AIP compliant, and much lower in sugar than other traditional recipes. Tigernut is the main flour in the crisp, and it is not a nut! You can read more about tigernut here. This isn’t a coconut free recipe and I wouldn’t suggest subbing these out. You can also sub honey if you’re not vegan. Add the filling ingredients to the baking dish and mix well to combine. Set aside. For the crisp topping, combine the shredded coconut and the flours in a large mixing bowl. Stir in coconut oil and maple syrup. 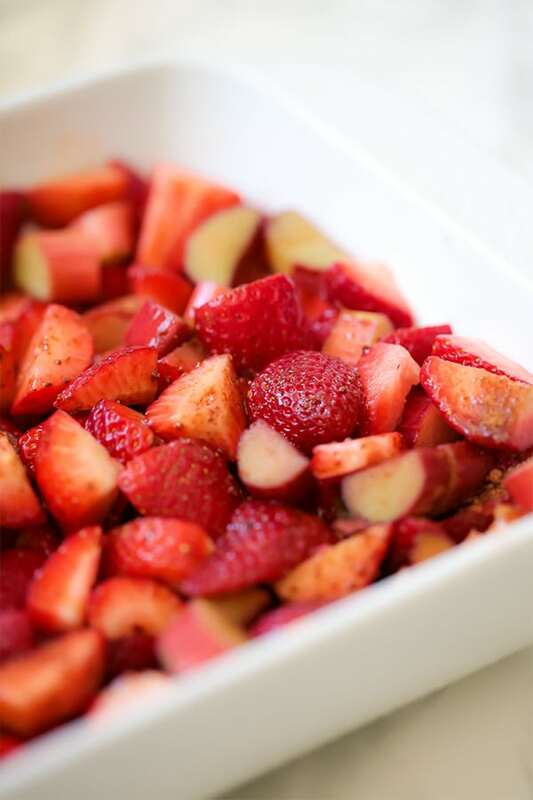 Use your hands to evenly spread out the crisp topping over the strawberry rhubarb filling. Bake in the oven for 35-45 minutes or until topping is crisped. Remove from the oven and allow to cool before serving by itself or with a compliant vanilla ice cream. Thank you for this recipe! It was delicious, easy, and really needed:) Since you mentioned the topping seemed like a cookie, I actually took a little bit and made one cookie out of it to test it. I would definitely make another batch of topping at some point, just to make some little cookies. Will be using this recipe again. This was surprisingly sweet with such a small amount of sweetener! I really thought it wouldn’t be sweet enough but it was! I will make this again! Thanks. This looks amazing! Will make asap— how many servings does it make would you say? Ahh thank you so much Ash!! I am so happy you like it! It’s one of my favorites. Great recipe. Thank you 🙂 My (non-AIP) husband declared it the best crumble I’ve made since going AIP, and I’ve made MANY! Delicious! I added a bit of maple syrup to the fruit mixture and cinnamon to the crisp and it turned out great. Will definitely make this again. My husband raved about it!